Highcliffe is a very comfortable and friendly registered nursing home set in one of Dorset’s most prestigious areas, Highcliffe-on-Sea. The home occupies an enviable position on one of the resort’s quiet residential streets only a short distance from award-winning beaches and impressive clifftop views. The home offers high quality specialist nursing, residential, dementia and end of life care, with respite care also offered. Explore the services provided at Highcliffe, which are designed to make every resident’s stay a pleasant one. “The staff at Highcliffe Nursing Home are absolutely Marvellous! All staff so friendly, welcoming and caring. They work exceptionally hard. Thank you!”. “We cannot express our thanks in words to you and ALL the staff at Highcliffe in the care and love that was given to dad. Our whole family have been in total awe of the way you all conduct yourselves and the care you provided. It somehow seems unfair to write at the end of your care for dad, as having been there pretty much everyday for the last two weeks, it is so apparent that it is just 'what you do' day in day out, and I am just sorry that I hadn't thanked you all previously. I think I mentioned it, but wanted to say thank you for allowing myself and my brothers the space and time to be there with dad, I am sure I was a total pain at stages, but it has been a total privilege to be there and watch you all and be part of the 'family' there for a short, but very special period of time. Please, please pass on our thanks to everyone that had contact with dad, it was clear that he was thought of fondly. As said, my vocabulary and words cannot express this enough but hope this goes someway towards expressing it”. “Thank you all for looking after my Mum for the last four years. The love and care that you have given her for been fantastic. Sue and I will miss you very much. Thank you again”. If you want a an attractive home full of life and love, with lots going on and also places to retreat for valuable peace and quiet, then look no further. If you are looking for a home with plenty of activity but where you can do as much or as little as you like, then you will have found it at Highcliffe. Highcliffe offers a self-contained, comfortable retreat set amongst beautifully maintained gardens where residents can breathe in the fresh seaside air. The building has recently undergone an extensive refurbishment programme the results of which are most obvious in its comfortable communal areas. The three comfortable lounges have large flat-screen televisions ensuring everyone can enjoy their favourite programmes. The conservatory area is light and airy - a popular place for residents to meet with friends and family. The warm and friendly dining areas are where most residents choose to tuck into the delicious, freshly prepared homemade food, although if preferred the meals can be served in the bedrooms. We believe the combination of a great setting, invigorating sea air and knowledgeable staff make this a truly special place. As with all Kingsley homes, there are regular visits from hairdressers, chiropodists and holistic therapists. There is also an active entertainment programme for those who wish to participate, which includes a film club, yoga sessions, music afternoons and visiting professional entertainers. These activities are offered on a one to one or group basis. Within the house we are fortunate to have a well-equipped multi-sensory room, which brings great pleasure to a number of residents, as do the themed functions that take place throughout the year. Being diagnosed with a dementia can be a very difficult and confusing time for the individual and their loved ones, and it is only natural to feel anxious about what life in the future will be like. At Highcliffe we strongly believe that the transition into our care should be smooth and carefully assessed in order to minimise upset to all concerned. We place great importance on the lives our residents have led, and spend time with them and their family members to find out about their tastes, history, hobbies and interests. Family and friends are significant partners with us and we welcome feedback and suggestions at all times. The information shared helps us to create individual care plans for each individual; this is paramount in providing the best care and helps us get to know them well. Residents are given support to help them achieve their individual aims through taking part in meetings, surveys and one-to-ones. The staff members at Highcliffe all have a kind and caring nature, they fully understand the meaning of real person centre care and are skilled in engaging residents in meaningful activities. The home is continually committed to specialist training, which enables staff to help individuals express their needs and to maintain a high level of independence, self-worth and well-being. We welcome and encourage our residents to make their rooms as homely and personalised as possible. This is achieved by introducing a resident’s own belongings to create a space in which they will feel safe and happy. Paintings, a favourite ornament or two and plenty of family photographs can all be of comfort and will help to calm any unsettled feelings. Residents can rise whenever they like and have a choice between a hot and cold breakfast or have both at times. They are welcome to have breakfast in bed but most enjoy the atmosphere in the communal, friendly dining room. The staff on duty dine with the residents and don’t wear uniforms or badges, which adds to the relaxed, homely feel of mealtimes. Families and friends are welcomed at all times of the day and residents are encouraged to maintain social contacts they had prior to moving into Highcliffe. The enthusiastic, caring staff are always on hand to be with residents throughout the day and at night if required. The staff are compassionate people who love to help the residents do what they enjoy. They naturally engage with the residents, to swap stories, to laugh and cry with them, while residents are encouraged to follow their own interests and make their own decisions. For lunch and supper there is a choice of main courses and desserts, and we invite the able residents to help set the tables, which involves them in the daily running of the house. Many residents enjoy helping out around the home with other chores and have a lot of input about all the choices made within the home, such as potential staff, building conversions, additions and decoration. Mealtimes are a sociable part of the day and staff are skilled at persuading even the quietest residents to become involved in the conversations. After supper, some residents opt to go to bed early or retire to their rooms, while others stay up until later, relaxing in their choice of communal area. There are hot and cold drinks, alcohol available to those that want it, and NO set bed time, as this is the residents’ home. Each Kingsley care home is unique, but we all have a set of highly respected and award-winning features embedded within the culture. Our daily emphasis is on the care that our residents need, whether that be physical, emotional, and spiritual or with regard to mental health. “Thank you for your kindness and loving care given to our mum. Life has been hard for her but during her stay with you, no longer is she lonely.” Kingsley resident’s relative. At Highcliffe care home we offer nursing and dementia care, with a warm and homely person-centred approach from a stable and professional team, all trained in providing quality care. Every one of our residents is treated as an individual and given love and attention according to their needs. We believe it is these things that lead to a better and more dignified quality of life. Residents who are experiencing memory loss benefit from our enlightened approach to dementia care which stimulates, supports and comforts those in need. We are committed to providing the best possible outcomes for our residents, and we achieve this through our ‘Wings’ (Welcome, Individuality, Nurturing, Guidance, Sensitivity) philosophy of care. This award-winning approach is nationally recognized and our bespoke learning programme is designed to ensure that the person with a dementia is at the heart of everything we do. We place great importance on the lives that our residents have led prior to joining us and spend time with them and their family members to find out about their tastes, history, hobbies and interests. The information gained helps us to create individual care plans that are paramount in providing the best care; ensuring we get to know our residents well. Residents are supported to achieve their aims by taking part in meetings, surveys and one-to-one discussions. The staff here are all of a kind and caring nature, they understand the meaning of real person-centre care and are skilled in engaging residents in meaningful activities. The home is committed to specialist training, which enables staff to help individuals express their needs and maintain a high level of independence, self-worth and well-being. We know that this approach is much appreciated by the residents who live with us, and their experience of living here is that of love, achievement, encouragement and fulfilment. Each Kingsley care home is unique, but we all have a set of highly respected and award-winning standards embedded within the culture. Our daily emphasis is on the care that our residents need, whether that is physical, emotional, spiritual or mental. Family and friends are significant partners within the home (as with all Kingsley homes) and are welcome to come and go as they please throughout the day. We listen to the people who live with us and their families about the services we provide and welcome feedback and suggestions at all times. We encourage all our residents to live as healthily as possible, to help them have long and pleasant lives. We encourage exercise, keeping minds active and eating nutritious food, and our healthy, balanced meals are made from scratch using only the best, locally sourced ingredients. We understand that people’s tastes and habits are different, and we ensure that the varied menu includes a great selection of nutritious delights and individuals’ favourites. Because of its emphasis on specialised nursing care and its ideal location that makes it so pleasurable to visit, Highcliffe serves a wide area within Dorset and the New Forest, including Brockenhurst, Lymington, Lyndhurst, Ringwood, New Milton, Christchurch and Bournemouth. Just tucked away from the busier high street areas, this large Edwardian property with its modern extension is set in well-maintained gardens in the village of Highcliffe. The home is close to the A35 and A337 and only a short drive from Christchurch, Lymington and the New Forest. Being just a short stroll from the seafront and Highcliffe village centre, many local amenities and places of interest are easily accessed by residents and their visiting families. Highcliffe provides quality nursing and dementia care for up to 45 residents at any one time. Large, comfortable communal areas are equipped with plenty of comfortable chairs and large flat screen televisions, and residents have independent access to a secure landscaped garden. To find out information about current availability, a person centred assessment or to simply arrange a visit please do not hesitate to contact the home. We actively encourage those who are considering living at Highcliffe to visit and spend some time with us to gain an accurate perception of the care we offer. You are invited to come for lunch or just for a look round the property. Staff are around at all times of the day and they will be happy to give you a guided tour and answer your questions. If you would like a discussion with the manager, then an appointment can always be made. Visit us virtually – Take a 360o virtual tour and get a feeling of Highcliffe Nursing home. We actively encourage those who are considering living at Highcliffe home to visit and spend some time at the home to gain an accurate perception of the care we offer. You are invited to come for lunch or just for a look around. Staff are around at all times of the day and they will be happy to give you a guided tour and answer your questions. 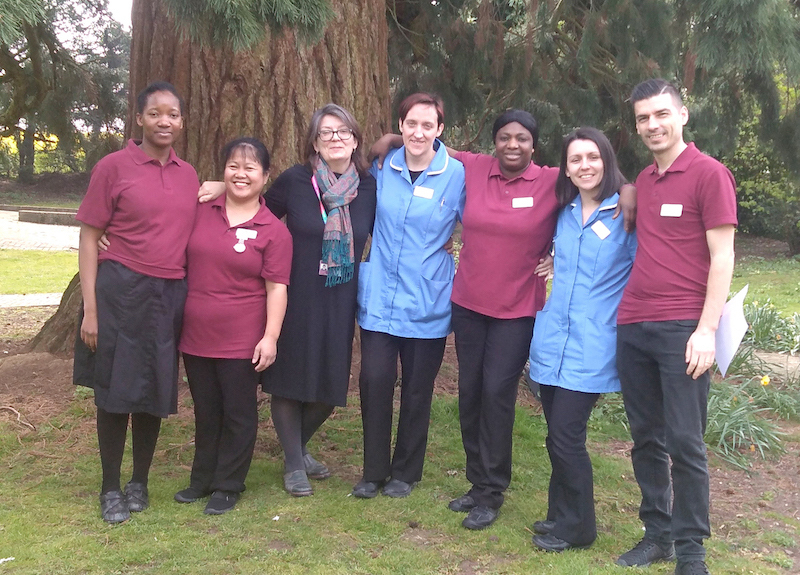 The care team at Highcliffe are specifically selected to meet the criteria of a person centred worker and all undergo a continuous programme of training at practical and theoretical levels. Our own training arm, Kingsley Academy, provides most of our teaching. Having worked in the finance world for several years I decided that a change was due. I initially joined Kingsley Healthcare as an administrator with additional responsibilities for activities. I have through the years developed my skills and knowledge base to secure my current position as Manager. This through the support and guidance of the local and senior management team. I really enjoy my role and very keen that we make differences in people’s lives on a daily basis. Something we at Highcliffe achieve to a high standard. I live locally with my family and enjoy the company of others and walking my dogs along the beach. We celebrate all the usual annual festivities, national holidays, birthdays, anniversaries and unique special occasions, and encourage all residents and their families to participate. Planting bulbs and garden activities..
We realise that the move to a care setting can be a challenging time for those moving and their relatives and we aim to make this process as stress free as possible. Please feel free to contact the home for any information or advice, and if we cannot help we will suggest where the best advice can be obtained. The home has made significant progress and is now compliant with CQC’s Fundamental Standards. We will continue to monitor and maintain improvements and work towards achieving a “Good” overall rating.